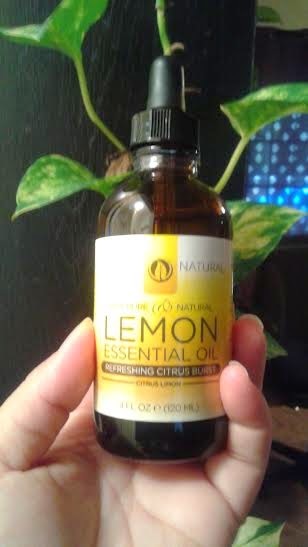 This is a exciting product out of a lot of essential oils that I have used I had never used a lemon one so I was excited to try it out! *The 100% pure natural Lemon essential oil is a refreshing citrus burst of citrus lemon from Insta Natural. It is extracted from the rinds of lemon, which leads its fresh citrus fragrance. This cold pressed oil has a strong bright scent that is both refreshing and uplifting. Its astringent and purifying properties also make it a great aid to help cleanse and tone the skin, while delivering a boost of Vitamin C antioxidant benefits. I love the smell of this oil it was my first time using it so what I did was put some on my oil diffuser so the aroma can go all around my home. The smell was very delighted and welcoming. We had cooked food the night before so I turned on the diffuser in the late morning so my house could smell nice and refreshed and it did. My home did not smell of food at all. Not only can you use this product for cleansing and toning your skin(test areas to know if there is allergic reactions, can use with a carrier) and as a aroma diffuser but you can also use this product for cleaning as well! (dilute it depending the surface or thing). ZPump Fusion – Coming Soon!